The Geodynamics Group is undertaking a 5 year program to monitor the postglacial rebound which may be occurring near the Lambert Glacier, Prince Charles Mountains, Antarctica since the Last Glacial Maximum. A transect of permanent GPS sites has been established from the coast up to 450 km inland. The aim of the project is to estimate absolute vertical velocities of the sites and, coupled with other geophysical data, to discriminate between several different ice models for the Antarctic continent. Contact Paul Tregoning for further details on this project. As part of the Ocean.US oceanographic project, two Iridium L-Band transmitters have been provided to RSES for installation at remote GPS sites in Antarctica. These satellite modems will be installed at Dalton Corner and Komsomolskiy Peak, two sites that are too far south for the Inmarsat data transmission system to work reliably. The use of the Iridium satellite modems will permit data to be transmitted from these two remote sites on a daily basis back to RSES. 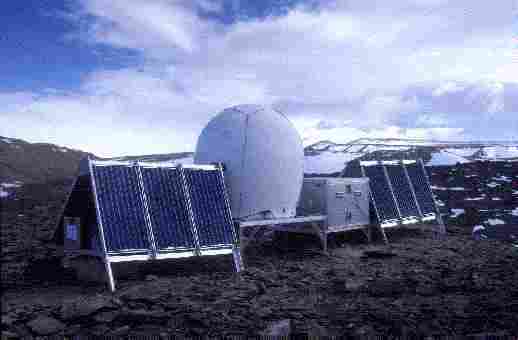 In January, 1998 we installed a remote GPS system near Beaver Lake, Antarctica to commence a long term postglacial rebound monitoring program. The equipment operated successfully from 12 January to 23 March, 1998 at which time there was insufficient solar power available to operate the equipment. A second solar-powered system was installed on 22 January 1999 to replace the system which wintered the previous year. 37 days of data were recorded before the receiver memory filled. In 2000 we increased the complexity of the equipment to include satellite phone communications and winter power provided by hydrogen fuel cells. We also installed two new sites at Dalton Corner and Landing Bluff. In December 2001 the Landing Bluff site commenced daily operations, transmitting GPS data back to Australia on a daily basis. The equipment operated until May 2001 at which time there was insufficient solar power to continue operation. In 2002 the sites at Landing Bluff and Beaver Lake began reliable, automatic operation and, as at 18 March 2002, are downloading GPS and system diagnostic data and transmitting the data back to RSES on a daily basis. The system diagnostic data can be viewed for Landing Bluff and Beaver Lake and is updated on a daily basis. Lake and nearby Auslig sites of Mawson and Davis.